The PKI 7350 is the first and most recognised portable explosives and narcotics trace detector that uses Luminol Chemiluminescence (Chemilumina) plus the unique GC/IMS (gas chromatography/Ion mobility spectrometry). It is the only portable device capable of detecting the presence of all the explosives incl. ICAO taggants, military plastics and TATP combined with a detection of cocaine, opiates, cannabis and amphetamine-type stimulants. It does not use any external carrier gas or radioactive source and offers extremely fast and reliable detection with very high selectivity for explosives. PKI 7350 should be used at any Police and Bomb Squad, Embassy, Sea- or Airport, Border Crossing, Government Building, Nuclear Power Plant or any other place where high risks of attacks with explosives may occur or where the use of narcotics has to be identified. • PKI 7350’s dual technology platform detects and identifies traces of specific explosives and narcotics within a multi-compound sample more accurately than single technology systems can do. • PKI 7350’s superior design and intelligent analytical software allow exceptional trace detection performance and by this offers a maximum of sensitivity. • PKI 7350’s GC/IMS dual technology ensures the lowest false alarm levels. • PKI 7350 is easy to operate. Use the sampling tab to survey the target surface for traces of explosives and the unit processes and analyses the samples immediately and displays the results on its touch screen, making detection an easy process that only takes seconds. Just a simple one-step process is to be made and with minimal training this device is a perfect tool for areas with high turnover. • PKI 7350 has a built-in networking and communication capability. 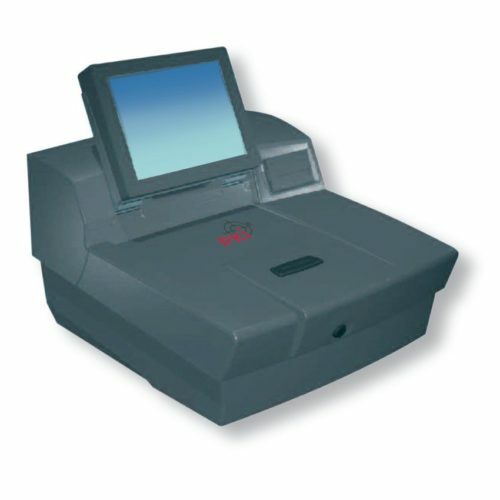 The device can easily be interfaced with other screening systems, creating a comprehensive security solution. • PKI 7350 offers continuous action and complete analysis within seconds i.e. a high throughput – ideal for high volume environments like airports and border crossings.